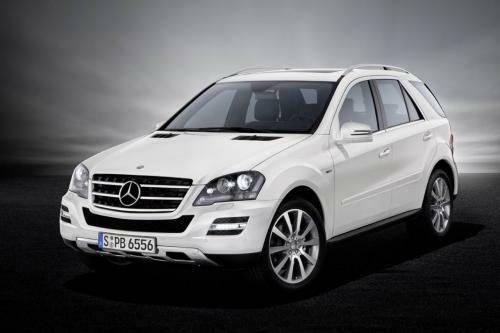 The German car-maker Daimler has revealed the 2011 M-Class Grand Edition. The special edition of the premium SUV now sports a bunch of new modifications in the form of some cosmetic touch ups and upgraded equipments. Starting from its outer shell, the 2011 M-Class Grand Edition features blue-tinted windows, darkened headlamps and LED technology for daytime running, an AMG grille, aluminum roof rails, extensive chrome package and power-dome hood (standard on the ML 450 CDI 4MATIC and ML 500 4MATIC). The SUV rests on 19-inch light-alloy wheels in a Y-spoke design with tire size 255/50 R19. A stylish set of 20-inch bi-color light-alloy wheels are also available as options. You may chose to paint your Grand Edition in chromite black or diamond white color.